Creating a perfect smile by aligning the mouth and straightening the teeth, is the art and science of orthodontics. For many people, a better smile improves confidence and has a profound, positive impact on someone’s life! 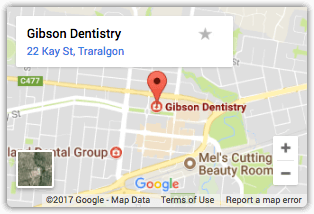 At Gibson Dentistry we pride ourselves on only using the latest techniques and contemporary technology to provide orthodontic treatment that lasts a lifetime. The IP Appliance system provides braces that are individually designed for your teeth. This results in a shorter and more comfortable treatment time. Computer-assisted diagnosis allows us to place the teeth in their final positions earlier on in the course of treatment, and so the teeth have a much better likelihood of staying in that final position for life. The Invisalign system uses clear aligner trays without braces, to move teeth. Treatment times however are generally longer than traditional braces. Ask us if Invisalign is suitable for your teeth!